In Scotland in winter the weather can really make things challenging. You will want to be properly prepared and kitted out in the right gear. On this page I will look at the gear necessary to have a comfortable winter day in the hills. If you are unsure that the gear you have is suitable please get in touch for a chat. We can often hire you the gear you need. For a winter walking day you will need a 35-45 litre rucksack. For a winter climbing day you will need a larger 45-55 litre rucksack. Make sure you have a waterproof liner for any spare clothing. Make sure everything can fit in your sack. Only your axes should be on the outside. For a winter skills or an introduction to winter climbing course a B2 (stiff 4 season leather or plastic) boot is appropriate. For an intermediate or advanced winter climbing course you will need a B3 (totally rigid leather or plastic) boot. You will need a good thick pair of socks and possibly a thin liner pair if it is very cold or for a better fit in your boots. A decent pair of long gaiters is essential. A pair of 12 point crampons with a crampon bag. Anti-balling plates are essential. Make sure that they are both suitable for your boots and that they fit properly prior to going out on the hill. If you are doing a winter skills course then you only need one general mountaineering axe which is 55-65 cm long. 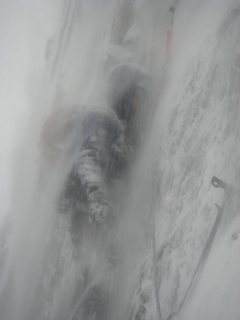 For a winter climbing course you will need 2 axes, 1 with an adze and 1 with a hammer. These should be about 50cm long and have leashes. This is necessary for all winter courses. Make sure it fits properly over a hat. This is needed if you are doing a climbing course. Make sure it fits over your multiple layers of winter clothing and that it can be done up with your gloves on. If you are on a climbing course your instructor will provide the appropriate rack. However, each individual client will need a belay plate, a 120cm sling, 2 prussics, and 3 screwgate carabiners. These are an essential piece of kit for the Scottish hills. If sun is forecast these are very important. It is important to stay hydrated out on the hill and sometimes non insulated bottles do freeze. It is important to have a map for your day on the hill and this should be in a good waterproof map case like Ortlieb. I would recommend a Silva compass. A halogen or super bright LED type is best. These should be breathable, waterproof and hardwearing. Very lightweight gear will easily rip in the winter mountain environment. Make sure your trousers have � or full length zips so they can be pulled on over boots. A thin synthetic or wool thermal top is essential and if it is very cold a pair of thermal long johns. 2 fleece layers for your upper body and a pair of fleece trousers or salopettes. If you get cold easily perhaps add a fleece gilet or waistcoat to your layering. Having an extra fleece top in a waterproof liner at the bottom of your rucksack is essential. It is very important to look after your hands in winter. A thin pair, a thick warm waterproof pair and a pair of thick mittens will often all be used in one day on the Scottish Hills. A fleece or thin woollen balaclava and hat are essential. Although reception is not always good on the hills, a mobile phone can be very useful. These are non-essential but for some big days on the hills they will help to look after your knees. If you do bring them make sure they can be taken apart and fit inside your rucksack easily if you are on a climbing course. A down jacket is not a good idea in Scotland because it is not often very dry. However, although not essential, a synthetic insulated jacket can be an excellent addition to your winter layers.